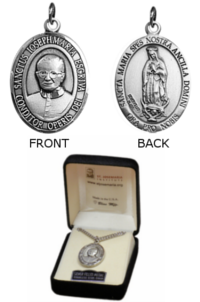 FRONT - St. Josemaria Escriva; Inscription: "SANCTUS IOSEPHMARIA ESCRIVA CONDITOR OPERIS DEI"
BACK - Our Lady of Guadalupe; Inscription: "SANCTA MARIA SPES NOSTRA ANCILLA DOMINI ORA PRO NOBIS"
The oval medal measures 1 7/8" and includes a 24" stainless steel chain and box. St. Josemaria Escriva was born in Spain in 1902 and was ordained a priest in 1926. In 1928, he received the divine inspiration to found Opus Dei, a Catholic organization of lay people and priests who try to grow close to God through their ordinary lives. St. Josemaria died in 1975 and was canonized by Pope St. John Paul II in 2002. Your purchase today helps support the mission and activities of the St. Josemaria Institute: www.stjosemaria.org.